A fantastically stimulating disc, performed by two consumate virtuosos clearly dedicated to their task. Clarinettist Kari Kriikku and cellist Anssi Karttunen are outstanding instrumentalists in the outstanding generation of Finnish musicians that also includes Esa-Pekka Salonen, Magnus Lindberg and Kaija Saariaho. (...) the pieces are all played with the freewheeling panache and virtuosity that distinguishes the work of both musicians. (...) Lindberg's Steamboat Bill Jr uses Buster Keaton's silent classic as the starting point for a dazzling display of musical slapstick and acrobatics. All 10 works here were written for the Finnish Duo: all are accomplished, all brilliantly played (...) Tapani Lansio’s confrontational A Due, Paavo Heininen's Short I and Kimmo Hakola’s scintillating, incident-packed Capriole complete a collection both entertaining and substantial. 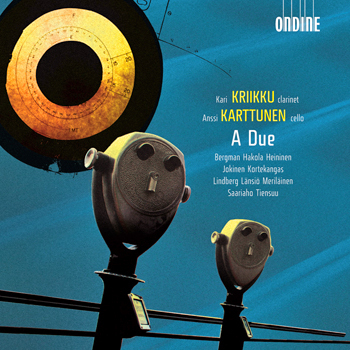 This CD contains Finnish contemporary duo music specially written for clarinetist Kari Kriikku and cellist Anssi Karttunen. The unheard-of and fascinating combination of these two melody instruments has no classical precedents and was introduced into Finnish contemporary music in the late 1980s, thanks to the featured performers and their close contacts to Finnish composers. The works were given their first performances at the Warsaw Autumn Festival in 1990 and recorded for Finnish Radio between 1992 and 2005. The performers are two of Finland’s foremost instrumentalists; clarinetist Kari Kriikku - an acclaimed champion of contemporary music and winner of both the Classic FM Gramophone Award 2006 and the BBC Music Magazine Award 2006 (Lindberg: Clarinet Concerto; ODE 1038-2) - and cellist Anssi Karttunen, who has equal credentials as a dedicatee of works by Magnus Lindberg, Kaija Saariaho, Rolf Wallin and Tan Dun. Kari Kriikku performs on clarinet (1, 2, 4-7, 9, 11) and bass clarinet (3, 8, 10, 12).